This can be a great hunger buster on you trade stand. Our chef can serve up 300+ hot dogs per hour if required. We cook and serve the /pork / frankfurters / Bratwurst in a roll with onions and sauce every 12 seconds, given the right amount of space on your stand we can use the vendor cart to cook ‘Posh Dogs’ served in rolls, baguettes and wraps, with all the trimmings. 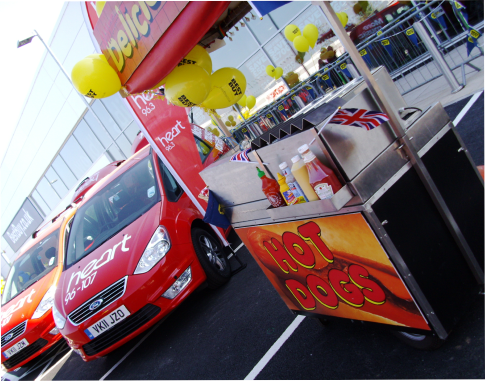 Our hot dog vendor cart hire has promotional areas to promote your company's Logo. Hot Dog Stand Hire - Rent a Hot Dog Cart - Mobile Hot Dog Vendor - Hot dog Catering Unit. 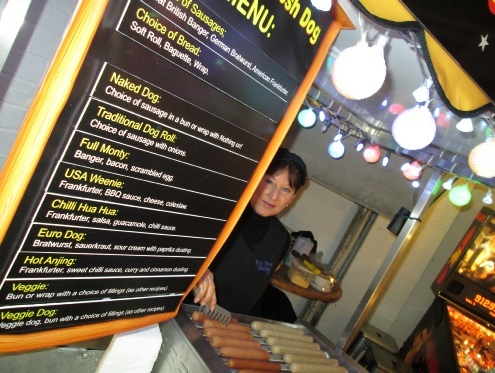 Looking for Hot Dogs cooked on your Trade Stand? 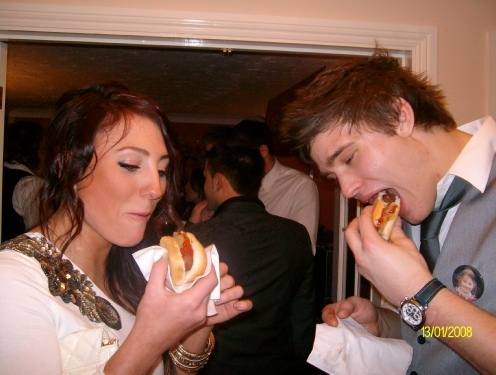 posh hot dogs, normal hot dogs, jumbo hot dogs. We require minimal room to produce any of the above, normally a trestle table is ample. Electricity will be required when inside and when outside the vendor cart is self powered by LPG. Our hot dog chefs normally dress in black and white catering outfits, but they are always happy to wear your company promotional attire when required, they can dress to blend in with your company’s colours, just let us know which option you would like? We try to please you and your customers. Expo Trade fair, trade stand catering. Freshly prepared and waiting in the wings! 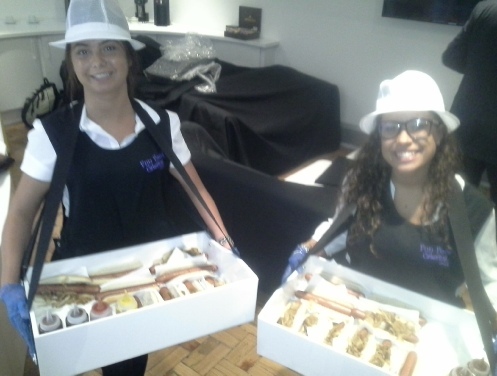 We can have everything required to serve up hot dogs in minutes, whenever the situation requires a fast turnaround (at the end of the trade fair). This exhibition stand attraction will make your guests ‘happy smiley people’ by filling the gap before the evening meal or the long journey home! Lilliebrooke Manor, Chelsea Old Town Hall, Business Design Centre, Sandown Park Exhibition and Conference Centre, Stoneleigh Park, Brooklands Museum, Dorney Lake, Alexandra Palace, The O2 Arena, Queen Elizabeth II Conference Centre, Epsom Downs Racecourse, Novotel London West, Bournemouth International Centre, ExCeL, Telford International Centre,The Brighton Centre, Old Billingsgate, Manchester Central Convention Complex, Royal Armouries Museum, Donington Exhibition Centre, Earls Court, National Exhibition Centre, Hilton Brighton Metropole Hotel, Cardiff International Arena, Olympia, Donington Park, G-Mex Centre, Ricoh Arena, Windsor Racecourse.